ST Update seems to have been around from at least the mid-late 1980s, evidenced from the above and my newly-rediscovered articles, both of which are on the subject of online communications (in the pre-internet era), something which I had been very involved with since my Amstrad-using days. I have also in this past week been able to acquire a single original issue dated August 1987. Sadly there are none of my articles in it, but it’s still extremely interesting, not only because of its apparent rarity, but because the two photocopied articles I have follow on from it, in the September and October issues. 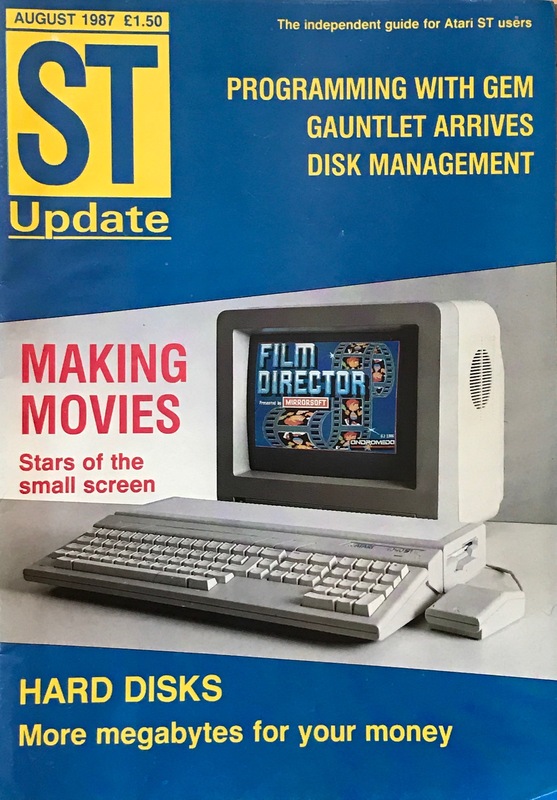 Did I have anything in ST Update before August 1987, and perhaps even in December of that year, or later? That remains to be seen, and I will be contacting various museums to see if they can help, as well as the British Library in London. I also have a few other Atari ST magazines to look through and search for, so that particular quest is ongoing. Meanwhile, since there seems to be some interest in ST Update, I have this evening taken the opportunity to scan my two articles to pdf, and they are linked as downloads below – just click on the images to open them. When I have time, I will also scan the August 1987 magazine in its entirety and place it here as well, in the public interest. In the meantime I’ve also made the front cover available as a jpg image – again, click to download/englarge. UPDATE 28 February 2017: Added a photocopied article by me, from an unknown Atari ST magazine, found in the loft yesterday, documenting the 16/32 Atari ST area of Micronet 800 on British Telecom’s pre-internet Prestel online system. It’s dated after May 1987, judging by the date on the Prestel screen dumps printed from a Sinclair ZX Spectrum on a ZX Printer!